Introducing our free Total Compensation Worksheet Tool! Most people think of their hourly wage or annual salary when discussing compensation. However, you are about to discover how to calculate the full value of your compensation package, which includes much more than just wage or salary. Do you ever feel like one of your employees doesn't really appreciate how good he or she has it? After using our new Total Compensation worksheet, your employees will have a much greater understanding of the total investment made by the company on his or her behalf. If you ask any employee if he thinks he is paid enough for what he does, more times than not the employee will reply that he doesn’t feel fully compensated for the value he brings to the company. No big surprise, right? The truth is that most people feel that they are underpaid. It's probably safe to say that the majority of people believe they should be paid more for one reason or the other. However, isn't it also true that the person getting paid, doesn’t usually remember, or take the time to fully account for, the total value they are actually receiving by the company? 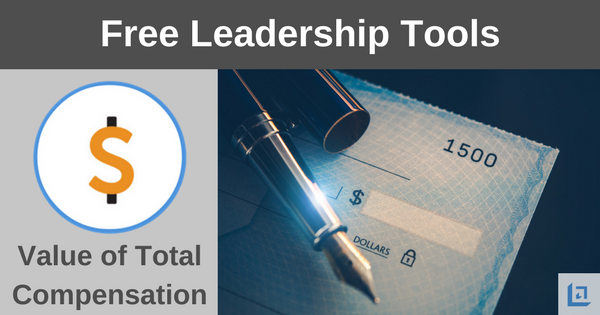 Our Total Compensation Worksheet is a valuable tool that provides leaders with a way to show their team members the full value of working for the organization. This tool helps leaders in detailing the overall value of the financial rewards such as as base pay, incentives, benefits and perks, while also reinforcing the importance of other less tangible benefits. If your best people consider leaving the company based on the belief they will earn more at XYZ, Inc., they should be 100% certain that the total compensation package being offered is really a better deal. Before going further, let's quickly acknowledge the fact that in some cases, particularly in low paying environments where employees are not compensated at industry market levels, and where employees do not receive key benefits like medical or dental insurance – there are employees who have valid gripes about being underpaid. There will always be situations where some employees end up working for business owners or companies that take advantage of their workforce. For those employees, they must ultimately make decisions that enable them to change their working environment, or change employers altogether. It is also true; however, that many employees do not fully appreciate or give credit to their employer for the entirety of the pay they receive - this is the main issue we are tackling here by providing our free Total compensation Worksheet. Employees at all levels simply forget that in addition to the basic salary or wage paid by their employer, often there are a host of other benefits being provided. Some benefits are tangible, while others are not – yet all of these extra benefits provide real value to the employee, which he or she should be reminded of, at least on an annual basis. Leaders need to educate their team members about the "Total Investment" being made by the company to employ them. Why does this matter? Because it’s in the best interest of the company to retain good employees. Surprisingly, there are a large number of business owners who provide all sorts of perks and fringe benefits to their employees, but don't take the time to inform their team members of what it costs to provide these extras. The truth is that both sides should have a clear understanding of what each party brings to the table. Every employee should know the actual value of the investment the company is making on his or her behalf. This just makes good business sense on so many levels! "We will often find compensation if we think more of what life has given us and less about what life has taken away." Using our free tool you can make sure that your employees know the full extent of the compensation and rewards paid by their company. The Total compensation worksheet tool is simple to use and can make a powerful impression on your team. People don't always realize just how good they have it, unless you take the time to point out the full extent of the value they are receiving. After entering the basic "Cash Compensation" values, which employees also see on their monthly paystubs (I.e., Gross and Net Pay, Vacation Pay, Sick Pay, Holiday Pay, etc.) then you can go on to highlight some the other items that employees can quickly learn to take for granted. If your company offers insurance benefits, be sure to include the value that is paid in by the company. Insurance Benefits might include: Medical, Dental, Accidental Death & Dismemberment, Life Insurance, Dependent Life or Long Term Disability. Other Fringe Benefits might include: Club Memberships, Dues, Subscriptions, Cell Phone or Parking allowances, Public Transit/Tuition/Childcare reimbursement, Computer/Laptop expense, Matching Gift programs, Employee Discounts, costs of Training/Seminars/Continuing Education, Relocation/Moving program or Health/Wellness subsidies. Retirement Benefits are also very important to include: For instance, does your company provide a 401k or Roth IRA option? If so, then be sure to include any "match" amount paid in by the company. Other retirement benefits might include the cost of pension or company profit sharing programs. Don't forget to mention any Intangible benefits of working for your place of business. Although these items won't be listed with a hard value on our worksheet, you should still consider mentioning these in a newsletter or one-on-one discussion. For example, depending on the reputation of the company, employees receive value in the form of working for a prestigious and highly respected organization. Name and brand recognition might be a valuable asset in a team member's ability to close sales. Your company may be located in a truly ideal spot, making it easy for them to drop their kids off at daycare, carpool with their neighbors, or workout at the gym during their lunch break. All of these kinds of things provide value to the employee and it's important that they do not lose sight of the many benefits they receive. Every company should take credit for the investment they make in their employees. Make sure your employees realize the total value of what the organization delivers. Again, informing your team on the subject of total compensation just makes good business sense. The more they realize what the company does for them, the more they will be willing to do for the company. Notice at the bottom of the Total compensation Worksheet there is space provided for the supervisor to add remarks. This is a great time to recognize your team members for all the hard work they do throughout the year and to let them know how much you appreciate their efforts. If you have a relatively small team, you are encourage to hand write your comments for an added special touch. Be sure to sign and date the worksheet at the bottom. After downloading our Total Compensation worksheet tool, you’ll be able to provide each employee with a full accounting of the value they receive. We recommend that all employees receive a Total Compensation Statement at least once per year. Taking time to education your team members also sends a positive message that you care about their well-being. When your team knows you care, they will want to do a better job; they will become more loyal, and as a result the company will experience less employee turnover. So take the time to educate yourself and your employees on the true value of working for your organization. This one small investment will pay continuous dividends. To download our free Total Compensation worksheet subscribe to our free newsletter. Once you subscribe, you'll immediately receive a password granting access to our entire leadership tools library.